HMCS Ojibwa is about seventy men in a sealed tube living on the cutting edge in perilous times. Any moment could have been their last; some came closer than others to a watery grave. We will arrange a version of our three hour Greater Depths Tour for your team building experience which will have your group up and active as well as contemplative as they marvel at what it took to wear the dolphins of the Silent Service. You may find yourself laughing till you cry - at least when the hair on the back of your neck isn't standing at attention from walking a moment in their shoes. Perhaps your workplace is experiencing some issues whether it comes from a sense of lack of amenities to general getting on each others' nerves or chaffing at the rules and regulations. Retired submariners will tell you how such matters were diffused when you couldn't just leave slamming the door behind you. Things can get even more tense when you haven't seen the sky for more than a month - there are no windows on submarines. Find out how the twenty one men in Jr. Accommodation decided what music would be played, the tricks they played on each other, what to do when you are 6 ft+ and your bunk isn't. 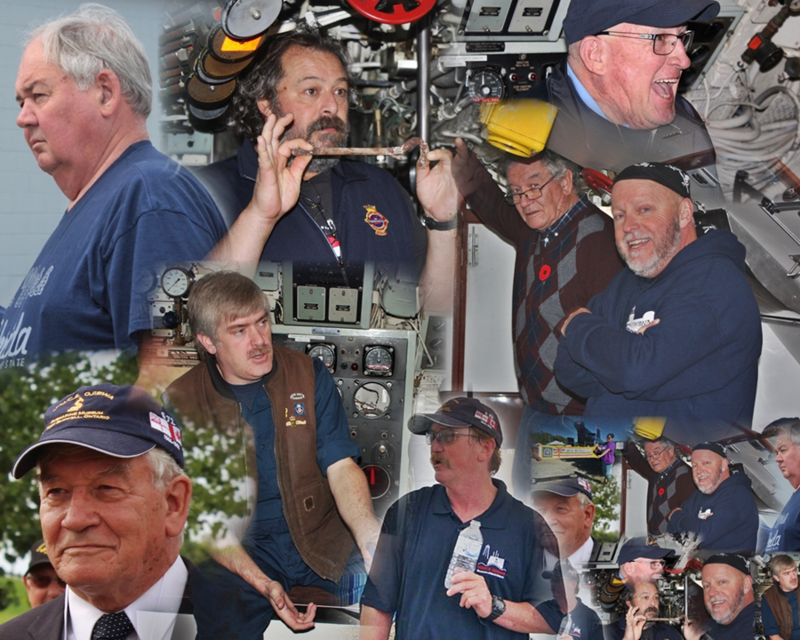 A few of the former submariners who volunteer to lead these events. Mind you, a submariner's workplace is the oceans of the world and as submarines in a NATO nation, Ojibwa, Okanagan and Onondaga were in most of them. Sometimes they were in places where they hadn't been invited and sometimes they dropped off or picked up 'Riders' (who weren't about to tell you where they were going or what they were going to do). Photography via the periscope was not a hobby. The clandestine world of the Cold War was not confined to the streets of Berlin and the only equivalent of Check Point Charlie under the sea was to be very good at what you had to do. It won't take long before you realize that you are in the middle of something extraordinary. How you measure up is entirely up to you.